Jack left for camp this morning. That means there won’t be anything new to report (other than a little oxidation) for the next two weeks. Gentlemen. a wonderful read thus far, keep up the good work! Jack stopped in for a couple of hours to bring his parts inventory backlog up to date before taking off for camp in the morning. Mission accomplished. Friday night, Dad and I finally got a chance to visit the garage after a three week break. Luckily, everything was where we left it. Our first task was to check the rat traps we set last time. 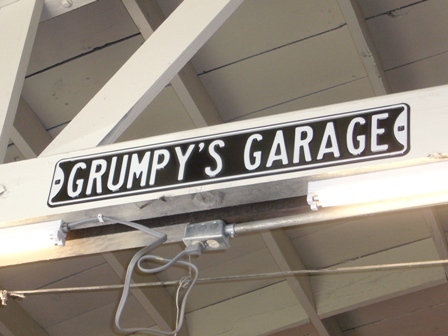 Although we love working in our grungy, commercial-style shop, it can have its draw backs. When Rob dropped in for a visit a few days ago, we spotted two rats climbing down the pipes, and immediately headed off to purchase traps, bait, and poison. Although we didn’t catch any, we did find a dead mouse who had been nibbling one of the poison boxes we strategically placed around the garage. We attempted to take the motor off of the cherry picker and put it on the engine stand, but we realized that we had no bolts for it. After I took a hasty measurement, Dad went to Kragen Auto Supply to get some bolts using the measurements I gave him. After he returned, we tested the new bolts, and, of course, they were too small. After much trial and error with bolt diameter, length, and thread pitch, we finally figured out what size we would need for the next day. On Saturday we started early so we could get home for a family dinner. Dad set up the radio to listen to the US/Ghana world cup match while I opened up the toolboxes. Working on the Mustang has been taking up more and more floor space, so moving cars was first on our agenda for the day. Dad and I rolled the Mustang out the garage doors temporarily, and moved the truck (a 1965 Dodge A-100 pickup) onto the lift to get it out of the way. Today, Charlie will help move the Citroen 2CV under the lift and rearrange the two Messerschmitts and the Isetta while Dad sets up the security system, and I get started on the bins of parts to be inventoried. 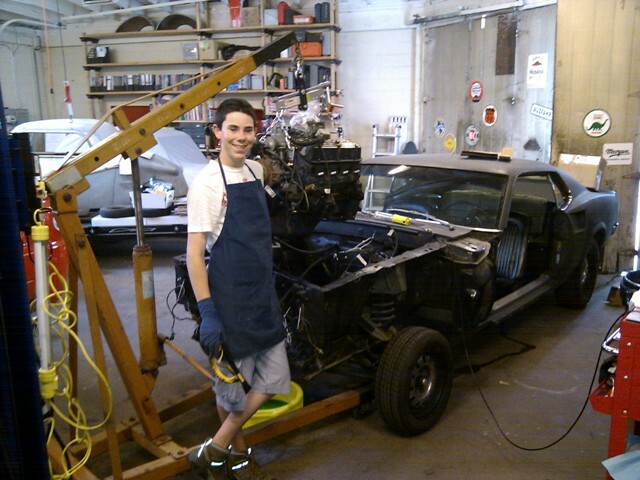 The rest of the day was spent disassembling the engine. After the valve covers came off, we removed the pushrods, placing them into holes punched into the bottom of an inverted cardboard box, and strung the rocker arms onto a coat hanger. This was done so we could keep the pushrods and rockers in order referenced to the cylinder from which they were removed, so we can check for unique wear patterns or problems that could be traced back to a specific problem location in the engine. Last off were the cylinder heads. We took extra care making sure all of the head bolts were removed, after seeing a grisly picture in one of our books of a head cracked in two pieces by its owner who got a little overzealous trying to pry it off after only removing four of the eight head bolts. Doh! Do you think he may be trying to tell me something? Where was my text??? I would have loved to have been there!! The fateful day finally arrived. Once I had finished cataloging the parts left over from our last work day, we ran a final check to make sure no mount was left secured, no hose attached, no wire plugged in. We also removed the bolts we used to secure the engine load leveler and checked that they fit their corresponding holes. After Dad and I were positive we were ready to lift, we supported the bell housing with a floor jack so it wouldn’t fall away when we removed the motor. 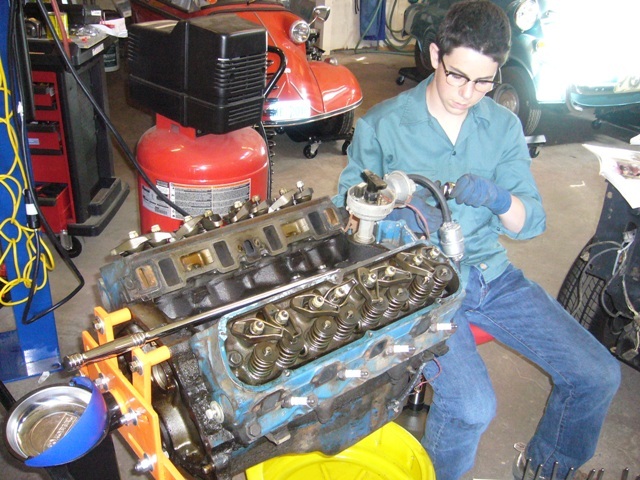 Using the cherry picker, we raised the engine a few inches to clear the compartment mounts, pulled it from the transmission converter, and continued lifting. Dad then saw, to his complete and utter horror, that we had not only forgotten to replace one of the load leveler bolts, but the L-bracket on the load leveler was barely supporting the edge of the block. He quickly lowered it back into the compartment while I replaced the bolt. Secured once again, the engine was lifted free of the compartment. With the engine free, we looked for the casting number to determine which specific engine model we have. After a little more degreaser and scrubbing, I found it above the starter motor: C80E-6015-A. We deciphered it using our Small Block Ford Engines book to determine we have a Cleveland-built 302, manufactured in ’68 or’69. It wasn’t the 390 that was originally installed in our S code fastback, but a great engine with lots of exciting possibilities. While waiting for our friend Rob toÂ arrive (who rebuilt his own ’66 289 cid. V8), we assembled 6 shoddily-constructed Chinese wheel dollies for the two three-wheelers in the TLG “Scuderia Bizzari”: Messie and Schmitty. Rather than forcing me to hand-tighten all 96 bolts to secure the casters on six dollies, Dad mercifully produced an air-powered socket wrench deep from the bowels of the Craftsman tool chest. When Rob showed up, he got a chance to check out the motor. 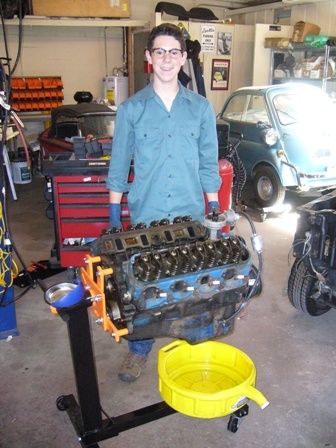 We asked him a few questions about his rebuild, and decided we would rebuild our engine as another part of the project. Moving the engine, now hanging from the cherry picker, required that we move the car, but the bell housing was still resting on the floor jack.Â My book recommended using coat hangers toÂ tie the bell housing to a 2×4 across the engine compartment. Without any coat hangers at the shop we improvised with Rob,Â using some heavy-duty zip ties to hangÂ the bell housingÂ from two broom sticks. The zip ties snapped underÂ the weight of the bell housing. Looks like we’ll be bringing coat hangers next time. You are currently browsing the Three Lions Garage archives for June, 2010. 55 mySQL queries in 0.199 seconds.